When arthritis is causing knee pain and joint degeneration, but the damage is only in one or two compartments of the knee, a partial knee replacement may be an option. Dr. Paul Chin and Dr. Brian Flowers are Mako certified in partial knee replacement. 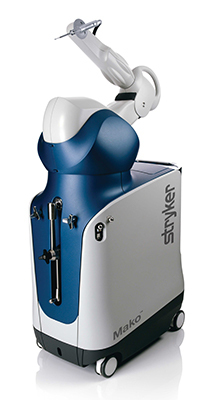 The Mako Robotic-Arm Assisted Surgery System for partial knee replacement is the latest technology used by SROSM’s orthopedic joint specialists when a full knee replacement isn’t needed. First a treatment plan is created based on your specific needs using a CT scan and the treatment planning software in the Mako Partial Knee replacement. Then, using the Mako Robotic-Arm your orthopedic surgeon can replace the damaged part of the knee without impacting the healthy bone and ligaments surrounding it. Recovery is typically shorter than a full knee replacement and you can begin any prescribed physical therapy very soon after your surgery. The SROSM physical therapists in Spring and in The Woodlands help knee replacement patients get back to their normal level of activity as quickly as possible. And they can do the same for you. If you’re experiencing knee pain, we recommend you schedule an appointment to learn about non-surgical and potential surgical procedures. If partial knee replacement surgery is recommended be sure to discuss the Mako Technology option with your surgeon. Watch our replay of this live video of Dr. Flowers discussing common knee pain and Mako Robotic-Arm Assisted Surgery.